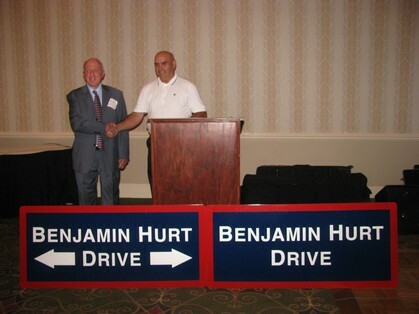 The above photograph is of Mr Benjamin Hurt, Principal of Albemarle High School from 1954 through 1984, being presented with the new street signs for the road system at Albemarle High School by Albemarle High School Alumni Association organizer, Charles "Connie" Crenshaw ('58). The presentation took place July 19, 2008 at the 50th Class Reunion of the Class of 1958 held at the Doubletree Hotel. Mr Hurt is a member and supporter of the Albemarle High School Alumni Association and attends every class reunion possible for the classes when he was Principal.